Though it's only four years old, Slack has evolved to become a leading cloud-based workplace collaboration app. Here's what it does, how to use it and why it could replace email in the future. Since its launch in 2014, Slack has become a popular tool for enterprise collaboration; it now has 6 million daily active users worldwide – around a third of whom are paying customers – and it continues to evolve to take on even more tasks. A good way to understand how ingrained Slack has become in offices is to consider the response when the collaboration platform gets knocked offline. A 45-minute outage in January became the top trending topic on Twitter in the U.S. as execs across the country wondered how they would communicate with colleagues two desks away. 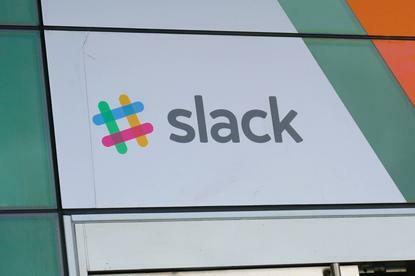 With a valuation of US$5.1 billion, Slack Technologies – the company behind the app – generated $250 million with its latest funding round and appears headed towards an IPO. Recently, it added former Goldman Sachs head of human capital management Edith Cooper to its board and appointed its first CFO, Allen Shim, who has been with the company for four years. Those personnel moves and the funding interest are clear signs that the company is maturing. Having gained a foothold in many organizations thanks to viral adoption by small teams of users – many of whom happily extol its virtues, thus prompting new users to sign up – the next step for Slack is to target company-wide deployments at larger enterprises. That would put it in even more direct competition with the likes of Microsoft Teams, Workplace by Facebook, Atlassian’s Stride, and a host of other lesser-known upstarts. 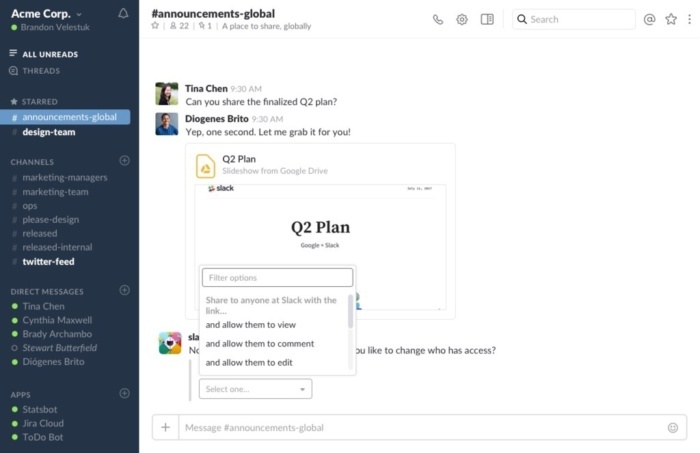 Put simply, Slack is a cloud-based application that connects teams of workers, allowing them to collaborate in real-time on projects and share documents, images, videos and other data necessary to do their job. It is available as a standalone app for desktops or mobile devices (Android, iOS and even Windows Phone), as well as via web browser. “The idea is to bring teams together to help them work together more efficiently and effectively,” said Richard Edwards, service director and distinguished research analyst at Freeform Dynamics. Of course, it is not just about work. Slack wants to make interactions more fun, which has been a big part of the secret behind its success: public channels can often be awash with GIFs and banter between colleagues, acting as something of a digital watercooler for workers who can be as close as the next desk over, or as far away as a different continent. Slack started life as a messaging tool for developers working on a video game. After the game development was shut down, attention turned to building out the instant messaging app that was to become Slack; that effort was headed up by founder and CEO Stewart Butterfield, who also co-founded the photo sharing site Flickr. The first version of Slack in its modern incarnation appeared as a beta in August 2013. The basics of Slack are simple for new users to grasp, which helped its viral spread. Teams of users are organized into workspaces where they can communicate and share documents. Smaller businesses are likely to have only one workspace, while larger enterprises may have multiple interconnected groups. Three types of channels exist within each workplace for team members: public, private and, more recently, shared channels. The latter enables communications with staffers at external companies. Channels allow discussions to center on a specific project, team (such as sales or marketing) or a shared interest topic (video, for example). 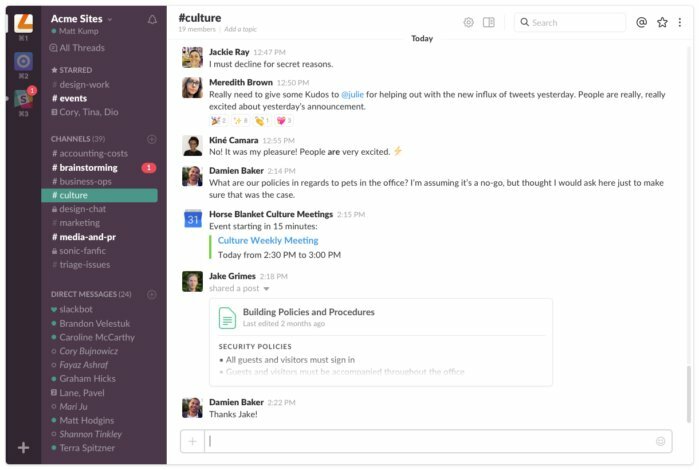 Slack has high hopes for channels: "We believe Channels will replace email as the primary way that people communicate and collaborate at work,” a spokesperson said. The app also offers direct messages for quick conversations with another team member. Ad-hoc groups of up to eight members can be set up, with colleagues easily found by searching in a Team Directory, which provides an overview of people in a company. Since launch, the platform has quickly added new features. Video and voice-calling capabilities were rolled out in 2016 and last year screen sharing was enabled – the result of Slack’s ScreenHero acquisition. Other recent feature additions include the long-awaited introduction of threaded messages. Each workspace starts off with two channels, #general and #random, but most users will want to add more almost immediately. Once up and running with the software, it is easy to set up a new channel. Using the desktop app, first click the “+” icon next to the Channels heading in the left-hand side bar. From there you can select whether the channel will be public or private, give it a name and add in any other relevant information (such as the topic of discussion). Next, you select members to invite by clicking the invite box (to browse a list of colleagues) or type a name into the search bar. The channel creation process is largely the same on mobile devices, too. For those who want to create an entirely new workspace, first head to the workspace creation page, slack.com/create. From here, you’ll provide an email address and receive a code to enter for confirmation, before adding display name, password and workspace name. The next step is to review workspace settings and permissions before you start inviting people into the new workspace. One of the main attractions of Slack is the huge range of app and chatbot integrations available for it. This means that users can interact with third-party apps such as Skype, Box or Google Drive from within Slack, helping position it as a central hub of productivity (or, in the case of the Giphy integration, a place to share gifs). Another popular integration is Atlassian’s Trello, a new breed of collaborative task management, which has some overlap with Slack but focuses on kanban-style boards to coordinate projects. 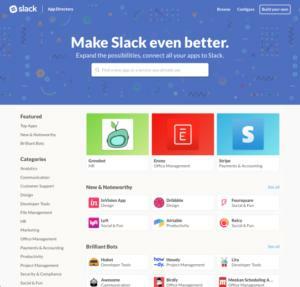 Slack has also struck partnerships with enterprise software stalwarts such as Oracle, SAP and ServiceNow – the last of which was one of the most requested by users. The ServiceNow integration allows incidents from the IT service management tool to flow directly into Slack channels. There is also a vibrant ecosystem of companies developing atop Slack’s platform, with thousands of apps now available in its App Directory. One example is the popular Slack-based to-do list and task management toolkit, Workast, which this week received $1.85 million in venture capital funding. Meanwhile, the Slack Fund, launched in 2015, provides funding to companies building bots on top of its platform. “Slack has grown to be much more than group messaging, as its 155,000+ member developer community can attest,” said Kurtzman. Automation tools, such as IFTTT (If This,Then That) also offer interesting ways to incorporate different applications into Slack. This could mean using smartphone location to notify a team channel when you arrive at the office, or remind team members to submit expense forms before the end of the month. A freemium model has been at the heart of Slack’s business since launch, and was a key component to its viral adoption by business users. In many cases, users sign up with Slack for free; from there, the tool tends to proliferate more widely throughout an organization, which then pushes IT to roll it out more formally. Slack for Teams features three tiers. The free service is limited to 10 app integrations, with search is capped at 10,000 messages and storage at 5GB. The Standard plan, which costs $6.67 per active user per month, offers features such as group video calls for up to 15 users with screen sharing, guest accounts and shared channels. It removes search limits, doubles the amount of storage and adds priority support and enhanced security features such as two-factor authentication. The Plus tier costs $12.50 per active user per month, and adds other features designed to appeal to large businesses and IT managers. These include user provisioning and de-provisioning, SAML-based single sign-on and compliance tools. There is also 24/7 support and a guaranteed uptime SLA. While various corporate customers use the Plus tier to support thousands of staffers, in 2017 Slack launched a product aimed squarely at larger deployments: Slack Enterprise Grid. The enterprise edition includes advanced security controls and user and administrative functions for an unlimited number of workspaces. It is designed to support deployments at companies with tens of thousands of employees with separate, but connected, workspaces. Enterprise Grid customers also gain access to Slack’s customer success and professional training teams, as well as a guaranteed four-hour response time for support. There are also improved security, compliance and billing features, as well as support for e-Discovery, data loss prevention and offline backup providers. Unlike Slack’s other products, pricing for Enterprise Gird is not disclosed; it's available on request, depending on a company's specific needs. Slack’s stellar growth has highlighted wider demand for new modes of interaction between staffers that move beyond some of the shortcomings of email and enterprise social networks. The result is a booming market for team collaboration applications. According to Gartner’s Workstream Collaboration report, the market will grow at a compound annual growth rate of 96% between 2016 and 2021, vaulting from $171 million to $4.9 billion over that five-year period. This is good news for Slack, which currently accounts for the majority of spending on work stream collaboration tools with $200 annual recurring revenues. But it has also prompted stiff competition spring up on a number of fronts, with some of the biggest vendors in the software market keen to get in on the action. “Microsoft Teams and Google Hangouts would be the primary competitors,” said Margo Visitacion, vice president and principal analyst at Forrester. While Cannell said Microsoft Teams is the biggest competitor to Slack, there are notable differences between the two platforms, with Slack more keenly focused on conversations and workflows. 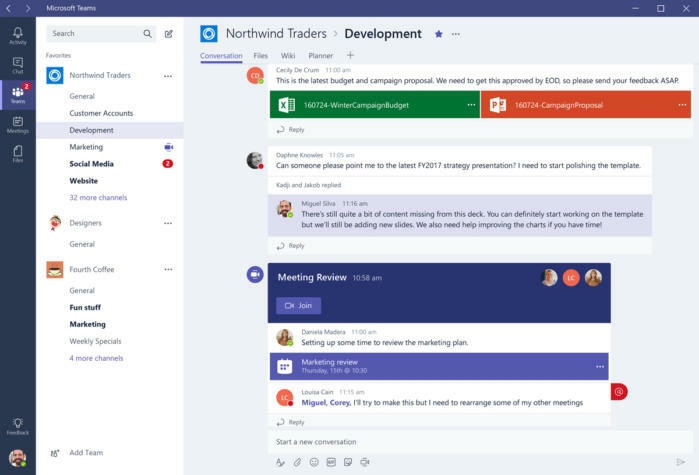 “Microsoft’s approach with Teams is different from Slack in that it front-ends other Office 365 features, such as the content collaboration capabilities in SharePoint and OneDrive for Business,” he said. Google, meanwhile, has relaunched its Hangouts tool, separating it into two apps: Meet and Chat, the latter of which is currently available as an early adopter preview. The forthcoming full launch of Hangouts Chat will present a further challenge to Slack as it will also be available as just one component of a G Suite subscription that includes email, content collaboration capabilities with Google Docs, and more. Google and Microsoft are far from the only competitors to Slack. In fact, there are a wide range of vendors offering tools that have varying degrees of similarity. Workplace by Facebook is one. It launched at the end of 2016 following a lengthy beta trial period and takes a more typical enterprise social network approach to connecting employees; nevertheless it can be seen as a collaboration platform. Atlassian – the Australian firm responsible for the popular HipChat platform – unveiled its own take on Slack last year with the launch of Stride. Cisco Spark, another chat-based collaboration tool, has stronger ties into companies with unified communications (UC) portfolios, including videoconferencing and whiteboards. Various UC vendors have launched chat tools, including Ring Central’s Glip, BroadSoft Team-One and Unify Circuit. New tools continue to appear, too, from established firms such as Zoho’s Cliq and startups such as Wrinkl, Twist, Flock, Symphony and many others. “There are a number of new players who are exploiting some of the changing gaps in the market, yet others are focusing on deskless workers,” said Kurtzman, referring to applications such as Zinc that target frontline staff rather than the knowledge workers Slack caters to. While Slack initially relied on viral adoption to gain wider adoption, more recently its attention has turned to enterprise customer usage and company-wide deployments. It has seen some success here: Slack recently reported some 150 large organizations are using its Enterprise Grid product, including Capital One, Target and 21st Century Fox. It has also focused on international expansion, with 55% of paying users outside of the U.S. The enterprise edition includes advanced security controls and user and administrative functions for an unlimited number of workspaces. It is designed to support deployments at companies with tens of thousands of employees with separate, but connected, workspaces. One of the challenges for Slack in terms of gaining a stronger big business foothold is to ensure that it can boost productivity without information overload. Demand for team-based chat apps has, to a large degree, resulted from frustration over email overload. Yet the more a company relies on a tool such as Slack, the more data it has to contend with. With that in mind, Slack plans to turn to artificial intelligence to play a greater role in optimizing processes. The company set up its Search, Learning and Intelligence (SLI) division in 2016 to help find ways to streamline use. This has led to the launch of features such as improved search capabilities to reduce time spent finding old messages and files and the ability to surface colleagues likely to know about a particular topic. 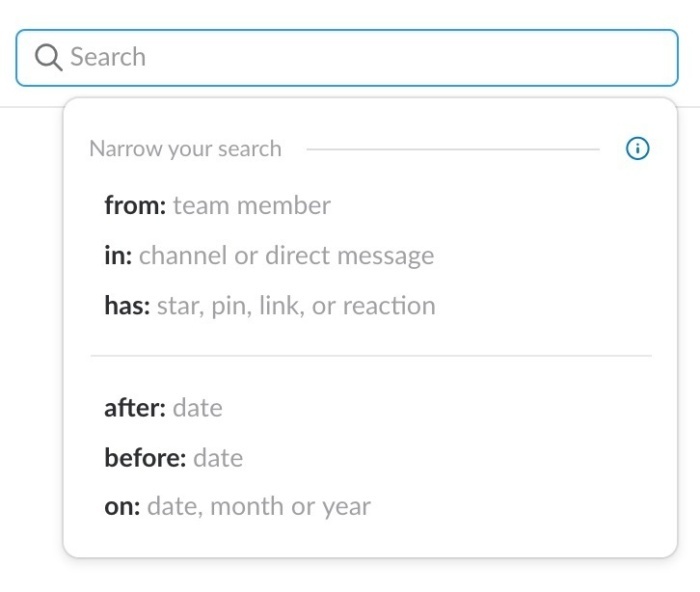 Search modifiers in Slack make it easier to find specific messages or content. SLI has also enabled personalized Slackbot suggestions for channels a particular user may be interested in. And a Highlights feature offers users an overview of the most important messages for an individual, based on their previous interactions. “We’re hyper-focused on finding new ways to implement AI in the workplace and evolve the future of work narrative,” a spokesperson said. Slack has also begun to invest in its sales teams to increase revenues; appealing to an enterprise audience means it must take a different tack to selling its platform. “Right now, the one thing that is holding Slack back in the enterprise is what has gotten them popular to this point, and that is being sold on a team-by-team basis,” said Cannell in a previous interview with Computerworld. This could be Slack’s biggest near-term obstacle: convincing enterprise customers that have existing relationships with a company such as Microsoft that its best-of-breed product is a better investment than the collaboration capabilities available for free within a suite of tools. “It is a vendor wrapped around a single product and obviously there are competitors – Google, Microsoft, Cisco and a few others – and arguably they can offer an integrated set of tools that address the kind of capabilities that Slack offers, but more besides,” said Edwards. However, as the first mover in the market it has its own advantage something the company seems to recognize.